Briget Boyle is a songwriter, vocalist and guitar player based in Oakland, California. 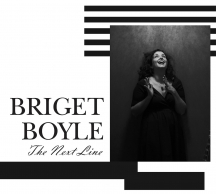 As part of a full schedule of performing, teaching, and touring, Briget and a talented group of guest musicians have just finished recording her second album, The Next Line. Briget's first solo record, The Parts Interior, came out in 2014 and was hailed as "emotionally resonant" and "sorrowful and redeeming."